In June, our team went out to Seattle for SMX Advanced 2018. While we were there we heard experts talking about how Google’s machine learning isn’t truly a hands-free solution and that campaign managers have to adjust and update CPA and ROAS targets anyways. After hearing that comment, our team got thinking about Acquisio’s machine learning technology (known as Acquisio Turing™) and how it addresses what Google’s machine learning lacks. It was a controversial and bold statement, even as a thought, so we wanted to address the situation with our readers. Before we get into it, let’s make some necessary introductions. We packaged our artificially intelligent algorithms, collectively known as Acquisio Turing, and launched them to the world last year. Using endless optimization, Acquisio Turing is made up of over 30 different algorithms that perform different tasks. While this machine learning technology was made famous for its bid and budget management (BBM) performance results, it has expanded beyond money management and is getting smarter at performing other PPC tasks everyday (stay tuned for more AI tools from Acquisio later this year!). By not targeting a specific CPA value, Acquisio Turing can opt to find the ideal CPA where the budget can be fully spent even under ever-changing conditions. So let’s address the situation at hand. What is the difference between Acquisio Turing and an automated bidding tool targeting a concrete CPA value? The answer is actually complex and is best given through different scenarios. Let’s explore these below using basic economics as it applies to PPC. In this hypothetical scenario, let’s say an advertiser sets up a $3,000 monthly budget and decides to target a CPA of $10. The monthly budget translates into a $100 daily budget (assuming 30 days in the month). With the $10 CPA-target the advertiser can expect 10 conversions a day, on average. Was the $10 CPA target a good choice? Let’s assume that from a business perspective the $10 target is justified. Given the account structure, the business, the location, is it even possible to get conversions at $10? If so, how many? Enough to spend the $3,000 each month? The only way to find out is to set up the automated bidding and watch the results. As we can see, the $10 CPA translates into 10 conversions a day at a $100 daily budget. 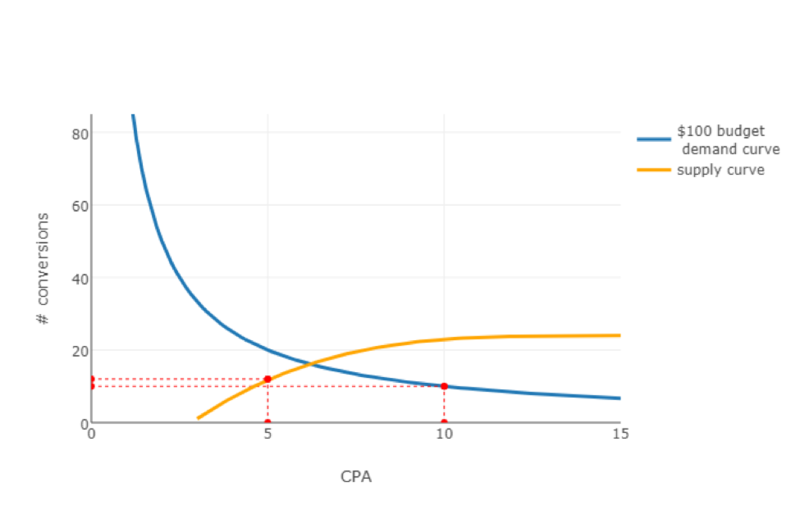 If the advertiser changes the CPA target, the expected number of conversions moves along this curve. But this graph alone does not answer what is possible. Can a $5 target CPA work and bring in 20 conversions a day? Again, the only way to find out for our advertiser is with automated bidding that targets a specific CPA (target of $5) and watch and learn. The actual answer comes from the supply curve of the auction market. There is a minimum price below which you can’t buy conversions. At the other extreme, if you’re above a certain CPA you basically own the market and the number of conversions you can get levels off (ie. at some point no matter how much you pay for more clicks, you won’t get more conversions because they’re just not available to deliver). The supply and demand curve for our hypothetical example is shown below. 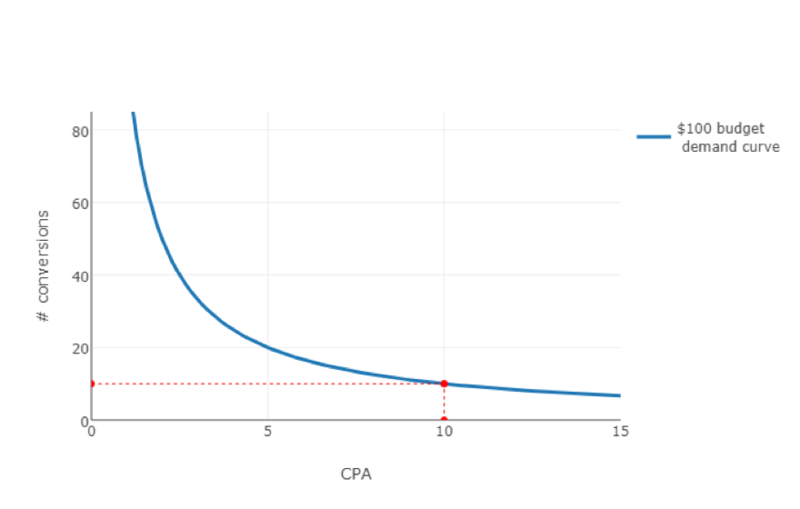 The graph above builds from our first one, indicating that the lowest our CPA can get is $3. However, at that low price you can only get 1 conversion a day, on average. Even at the desired $5 CPA the supply does not meet the demand; instead of bagging 20 conversions the market only yields 12, which is an improvement over the 10 at $10 CPA, but it’s still leaving $40 unspent each day. If the advertiser is determined to maximize the outcome of the allocated budget, it’s best to try a value somewhere between these and keep refining it – or – let Acquisio Turing’s machine learning algorithms do the job instead without having to worry about what target CPA to pick. When Acquisio Turing is activated on SEM campaigns, the supply-demand picture for the hypothetical scenario would look like the one shown below. The shape of the supply and demand curves is the same. What is new is the red line indicating the maximum price an advertiser can afford to pay for a conversion, set at $12 in this case. 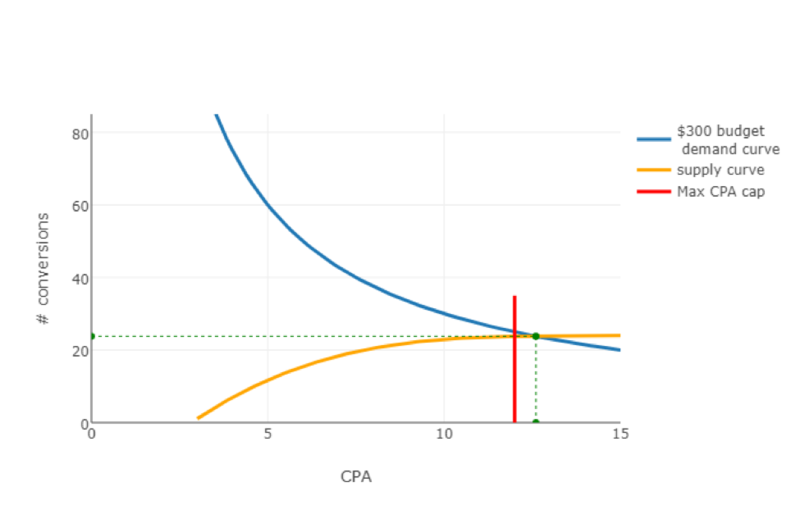 The point marked with green is the ideal CPA for the $100 daily budget where the budget is fully spent. That’s a $6.25 CPA yielding 16 conversions! Not bad at all. Acquisio’s bid and budget algorithms learn the location of this point and drive the bidding towards it until it’s achieved. This is all good and well for a stationary world, but internet advertising changes all the time. Advertising platforms change their offerings and how they manage advertising (eg. Search Engine Result Page policies and practices, emerging ad types, etc), the competition changes, or the advertiser’s circumstances can change. 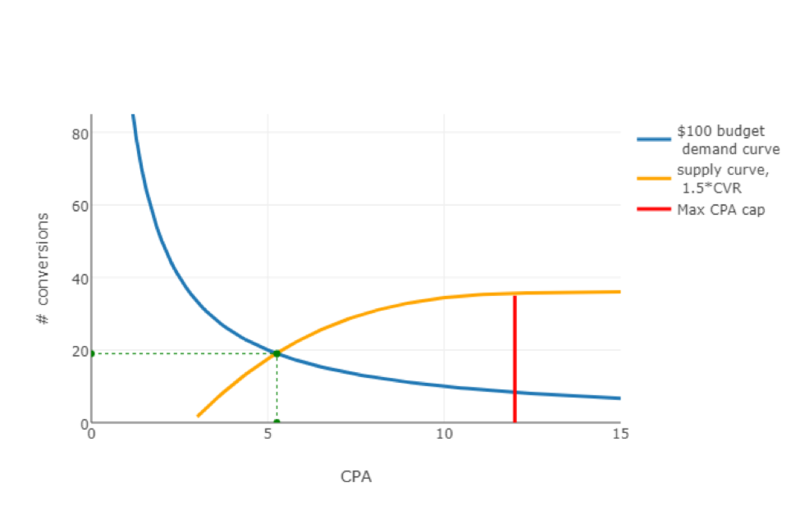 All of these outlying factors impact either the supply or the demand curve, which makes picking a single CPA target to hit all the more difficult on a daily basis. 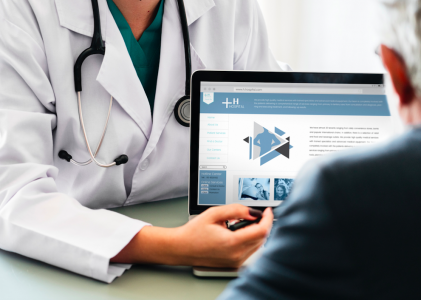 Suppose the advertiser, having studied their website performance, decides to re-launch the site with improved landing pages and navigation that increases the conversion rate by 50%. The auction market has not changed, but by making it easier for visitors to convert the advertiser is able to push the supply curve up. Because better campaign components yield better results, this change means that the ideal CPA has now shifted to $5.26 where the $100 daily budget can yield 19 conversions. Acquisio Turing’s machine learning algorithms pick up on this change on their own without having to be notified of it or without the advertiser having to estimate a new CPA target to set. 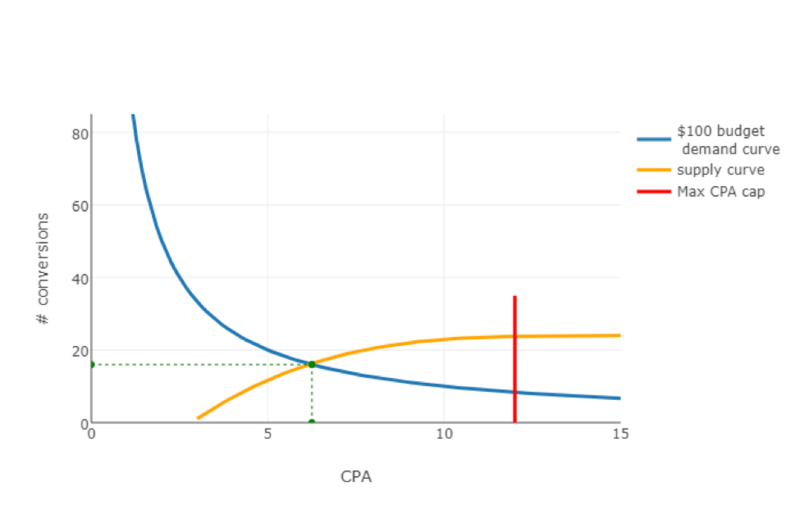 That’s the key difference between Acquisio’s machine learning technology and Google’s – the ability to be completely hand’s free with CPA targets or not. Another scenario we see often with our advertisers is the need to change the budget. Suppose in our hypothetical case the advertiser is happy with how well the advertising is driving conversions and wants to triple the budget. Triple budget should triple the conversions, right? Unfortunately not. Under the original supply curve, the $300 daily budget can only be spent by paying $12.60 per conversion. Note that this is beyond the maximum price cap of $12 the advertiser has set, and therefore Acquisio Turing will not be able to reach that ideal point. In other words, in this scenario it would be unable to fully spend the desired budget. There are countless other scenarios that impact the balance of supply and demand and keeping on top of them can be a daunting task for a human. Not for Acquisio Turing. 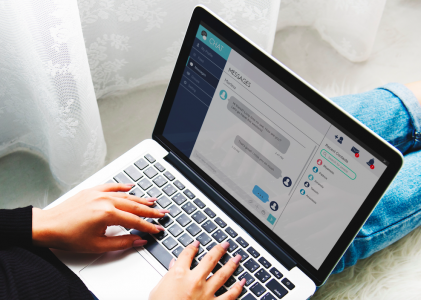 Our machine learning technology makes bid and budget decisions up to 48 times a day, keeping up with the ever changing advertising landscape, so you don’t have to. If you’re using Acquisio Turing for CPA bidding, you’ll want to apply some best practices to make sure you get the best performance. 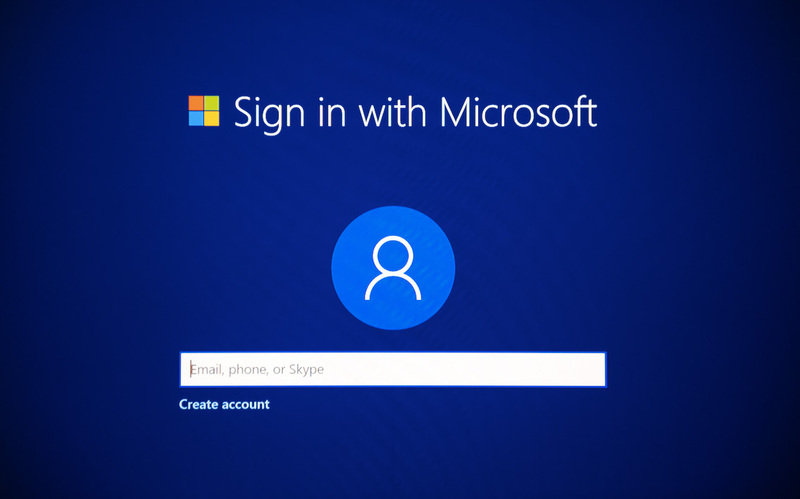 Advertisers need to have conversion tracking set up for Acquisio Turing to be effective. In the context of machine learning and automatic bidding, advertisers need a minimum number of consistent conversions that the system can learn from. By consistent conversions we mean some regular daily number instead of having a few random spurts of more conversions. Different advertisers have different goals when they create search campaigns online. From form fills and email signups, to page visits and actual purchases. There are a number of conversion events advertisers can track from search ad platforms. From a reporting perspective, the total conversions can include all potential conversion events defined by the agency or advertiser. However, the total number of conversions should really only include those that are worth optimizing. Campaign managers have to realize when they’re working with machine learning that these systems are unable to distinguish different types of conversions. Therefore when reporting, make sure to only include conversions that count, because Acquisio Turing is unable to tell them apart and they will be reported by count, not by type. Ultimately, Acquisio Turing is driving traffic to your site that is likely to convert. But it is up to you to create landing pages, navigation paths that guide the visitors to an easy conversion. All graphs created by Tamas Frajka. June 2018.